The Fuse 9W is Voltaic's 9.0W solar charging solution for full-size tablets and smartphones. Do you love spending time outdoors? Keep your phone or tablet charged during your hiking, camping, or cycling trips. 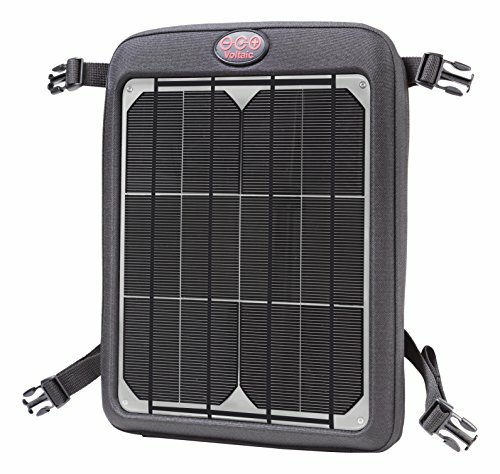 With a universal attachment system, it connects in seconds to backpacks, bicycles, MOLLE gear, or wherever solar power is needed. Includes a built in padded tablet sleeve for up to 10" devices. The Fuse 9W includes a removable 12,000mAh/44Wh rechargeable USB battery pack. The Fuse 9W's solar panel is available in silver or charcoal. Voltaic's products have been used on all seven continents by photographers, researchers, and outdoor enthusiasts to keep their gear running in some of the most extreme conditions! Each charger is engineered and individually tested in the USA by Voltaic Systems and covered by our two year solar bag and one year battery warranty. 7" Tablets: 1.7x tablet charges from the included V44 battery, 4 hours in the sun charges most tablets, 2 hours of tablet use from 1 hour in the sun. 10" Tablets: 1x tablet charge from the included V44 battery, 7.5 hours in the sun charges most tablets, 1.2 hours of tablet use from 1 hour in the sun. Smartphones: 4x smartphone charges from the included V44 battery, 1.8 hours in the sun charges most smartphones, 1 hour in the sun gives 6 hours of smartphone use. Tablets: Charges all tablets that are powered by USB including full size iPads, Samsung Galaxies. Note: The V44 it will not charge tablets requiring 12/16 volts. Digital Cameras: Charge cameras powered from USB, like GoPro. Not compatible with 12V DSLRs. V44 USB Battery: 12,000mAh/44Wh, Output: 5V/1A and 5V/2A USBs, Input: 5-6V/1A, Battery Type: Li-Polymer, Protection: Short circuit, over charge, over discharge, over current, over temp. If you have any questions about this product by Voltaic, contact us by completing and submitting the form below. If you are looking for a specif part number, please include it with your message.